Truth is a powerful weapon...but explosives never hurt. RedZone, Book 2 Sophia can run but she can't hide. RedZone is on her tail and those of the six tech-augmented soldiers who escaped its clutches with her. If she could only focus on fighting her way to safety, she might live long enough to disappear. But it's not just her own backside she needs to watch out for. At her side is her boyfriend, Kyle. 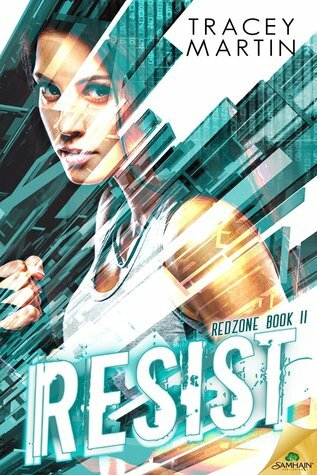 He's the reason she found the courage to escape, and she'll do anything to keep him and his secrets out of RedZone's hands. Only problem is, since she was once sent to capture him, he has good reason not to trust her. In fact, there's not much trust to go around. RedZone keeps finding them, suggesting someone is a traitor. And if that's not enough to recapture the group, the organization has a backup plan. One that will force Sophia and Kyle to choose between safety and risking everything one more time. Warning: Contains killer robots, mutant college students, and dangerous super soldiers. And those are the good guys. It's enough to make a rogue assassin wish she were taking her philosophy final instead. Hi, Tracey! Welcome to We Do Write. Tell us a bit about yourself. Thanks for having me! I’m mild mannered research consultant by day, and a crazed writer by night. Probably like lots of writers, I have weaknesses for coffee and wine, and I eat way too much chocolate. Although I grew up around Philadelphia, I moved to northern New England for grad school many years ago, and I totally fell in love with the Boston area. Good thing too because I haven’t been able to leave yet. Tell our readers a bit about RESIST. Resist picks up right where Revive ends, continuing Sophia and Kyle’s story. Each book stands alone, but they’re better read together. Usually I couldn’t answer this question because I have no clue where my ideas come from, but Revive and Resist were inspired by a movie I watched. I thought it had such an interesting premise, but it never followed through on it. I wanted a chance to redo that story. Of course, the end result doesn’t resemble the movie in any way, but that’s the fun of writing. Definitely a plotter! If I didn’t plan things out, my characters would never do anything except trade barbs. Plotting, ugh. Taking a premise and turning it into a complete story is just painful for me. The only thing I need is silence, or close to it. I can’t write in public because of the noise. Coffee doesn’t hurt either though! This is a tough question. I think I’d like amazing healing powers and to never get sick. Maybe it’s not flashy, but if we didn’t have to worry about getting hurt, I think we’d be willing to risk a lot more to help others. I’m not sure. I’ve googled too many weird things, but researching rates of decomposition in different climates or the temperature need for turning bones into ash—those probably rank up there. Curled up with a glass of wine, Netflix, and my husband. Here’s the part where you thank the people who are supporting you.Let's hear your shout outs. I love that you included this part because I love giving recognition to all the people who support me! I always have to give a shout-out to my husband first because he puts up this crazy-making hobby of mine, and to my editor who helps me make all my books so much better. I’m also super lucky to be a member of a couple great writing groups, and I don’t know what I’d have done without the support of the people in them. Thanks so much for stopping by the blog! And good luck with RESIST! Tracey Martin grew up outside of Philadelphia, the lucky recipient of a drama-free childhood, which is why she spent so much time reading about other people's lives. It was while she was working on her doctorate in psychology that she had an epiphany--imaginary people are way more fun than real ones. And so she began writing. Never able to choose just one of anything, she currently writes both urban fantasy for adults and contemporary stories for teens. She likes her coffee simple, her music epic, and her movies to contain explosions. A city girl at heart, she doesn't understand how she and her husband ended up living in New Hampshire, but writing keeps her off the mean, small town streets. You can find her online at tracey-martin.com.